Maybe I’m the last one realizing this, but it was actually recently I learnt that a session in Google Analytics that spans over multiple dates, for example 23:55 – 00:05, will be split into two sessions. Good to know if you for example work with conversion funnels. It’s time for one of these ‘not so interesting for you, but interesting for me posts’. Looking back at the August numbers was fun, simply because my latest post ‘Experimenting with the element.animate() function‘ was featured in codrops COLLECTIVE #128 which created a traffic spike. … 13.62% didn’t have Flash installed/support. How is a visit treated in Google Analytics (GA) when you move across synced devices? As a new visit or is the cookie shared, keeping the session alive? How is a visit treated in GA when you move across synced devices? As a new visit or is the cookie shared, keeping the session alive? I created a new website and implemented GA-tracking. The reason for this was to make sure that no other visitors would access the site during the test. I then enabled iCloud Tabs and Chrome’s Tab feature on my Mac and iPhone. 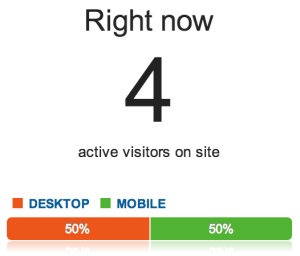 Visiting the website with Chrome and Safari (desktop versions) gave me two active visitors in GA and when I enabled each tab in Chrome and Safari on my iPhone the Real-Time data in GA showed four active visitors, which later also turned out to be four unique visitors. So according to my small test it seems that GA treats visits across synced devices separately (Visits 4, Unique Visitors 4). I’ve spent the evening digging into Google Analytics and I thought I’ll share some stats from the year that’s gone by. But first I would like to thank you all for visiting my blog. And that’s that, a brief summary of my blog stats for 2013. Now I’m looking forward to 2014.